Wednesday, April 3rd, 6:30 – 9:30 pm (In the James Lee Theater): Open Auditions. Auditions will be held in the theater on April 1st and April 3rd. Please come in the front of the community center and sign in at counter. Staff can point you in the right direction and signs will be posted. Julie Janson is an award-winning director. 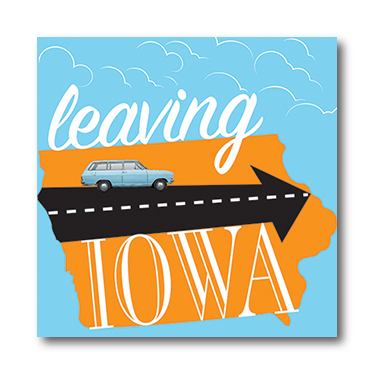 Leaving Iowa will be Julie’s third time directing with Providence: past shows include Amadeus (winner of 2016 Ruby Griffith Award for Outstanding Achievement in a Play) and Oleanna (2019). She has actively participated in more than 30 productions, on and off the stage, over the past 20 years. Her other directing credits include The Elephant Man by Bernard Pomerance (2012); Shadow Box by Michael Cristofer (2004); Black Comedy by Peter Shaffer (2004); and Reckless by Craig Lucas (2003). The biggest thing I will be looking for in auditions is the actor’s ability to have fun and take risks. There are a lot of beautiful, subtle moments in this show, but there are just as many crazy, wacky scenes which will require actors to take chances and shamelessly have fun. Every role is this show will require significant transitions: Three of the four family members must be able to play a younger and older version of themselves and the 2-4 four multi-role characters will be tasked with that ultimate challenge of creating multiple distinct, interesting characters. HOW WE WORK: You are welcome to come to audition on more than one of the open audition evenings. This is not a requirement. Most Providence auditions have actors up and down to read multiple times in multiple combinations and scenes. Most actors find this fun. As space allows, you will be able to watch the auditions. You may be asked to go into the hallway with audition partners and work a bit on a scene. We will do our best to get you up multiple times reading for parts you are interested in. You will also be asked to read for other parts you may not be auditioning for. The Providence Players strives to make our productions open to interested and engaged actors & actresses, regardless of their level of experience. We try and make our auditions as relaxing and fun as possible. AUDITION FORM: Resumes and headshots will be accepted, but are not required. Please ALSO COMPLETE the attached Providence Audition Form and bring it with you to the audition. We may ask to take a picture of you, but this is for internal use only and will not be shared. The Providence Players is a twenty-year-old, award-winning, non-profit community theater company. We usually hold auditions at our performance space in the James Lee Community Center in Falls Church, Virginia. An RSVP is necessary for planning purposes only. We do NOT require or make audition reservations or time slot appointments. Plan on attending as many of the audition session as you are able. We have fun at auditions and you will be up and down multiple times in different scenes and with different audition partners. No monologue is required. Follow us on Facebook for audition announcements!